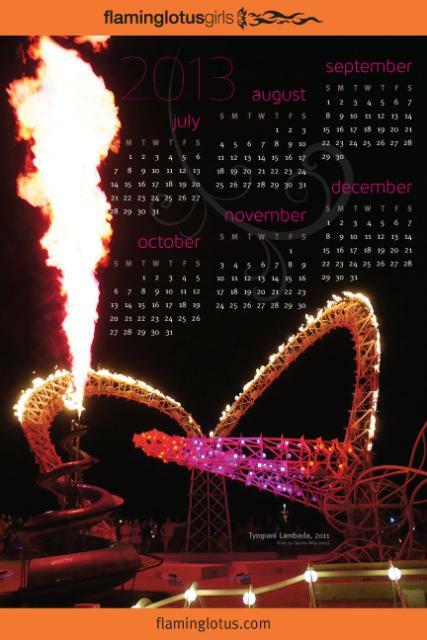 The Flaming Lotus Girls, a San Francisco-based “female-driven group of artists making kinetic, mechanical fire art,” have begun selling their two-sided poster calendar for 2013. It features images of their fiery large-scale art. 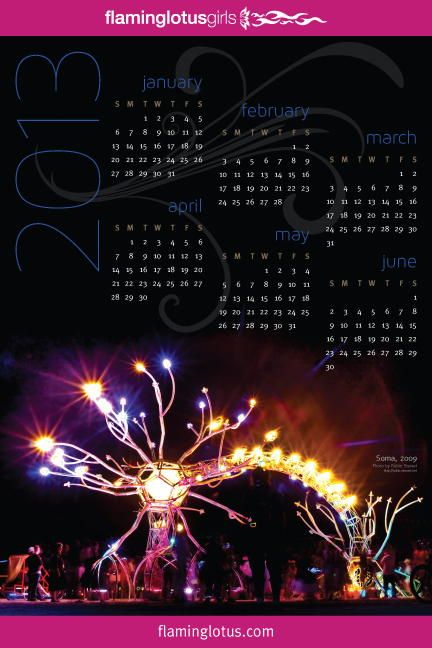 Our mission is to create monumental works of interactive art through a collaborative process. Our vision is to empower women to learn new skills and become experienced, talented and active artists in their own right. We premiere our work at Burning Man and bring the pieces to a civic audience afterwards. Our work – a combination of sculptural arts, kinetics, robotics, electronics, and fire engineering – is designed collaboratively; made collaboratively. We create interactive large-scale fire installations that engages viewers and invite them to become part of the art.